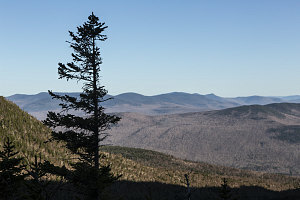 After a most excellent late winter climb of Mt Moosilauke a month before, we were back in the White Mountains again - this time for something a bit more spicy than a straight hike: a climb of the Great Gully Mountaineering route in King Ravine. 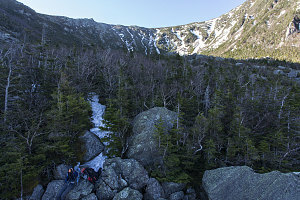 King Ravine is a large glacially-carved valley that heads north from Mt Adams, a beautiful and wild place far from the crowds of the nearby and much more popular Tuckerman Ravine. 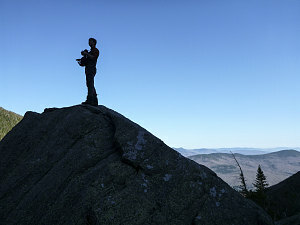 Not coincidentally, we've also planned a summit of Mt Adams into this outing, not only because it is a very nice peak, but also because it is/was one of Jenn's final Northeast 111er peaks. 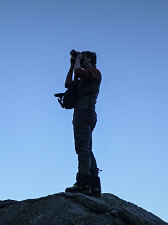 Part of the reason we wanted to climb the Great Gully Route is that it allows us to practice a bit of easy mountaineering - roped climbing on steep open snow, ice ax and foot placements, placing snow protection, setting up belay stations, etc - something we Eastern Flatlanders don't get much opportunity to practice. 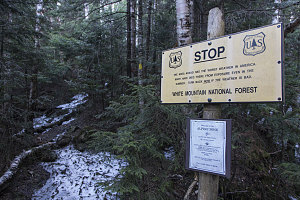 So, with this year's excellent winter snowpack rapidly dwindling away, we decided that we had to get to the Whites on this, the first weekend in May, or give up the idea of a mountaineering snow climb in this neck of the woods this year. 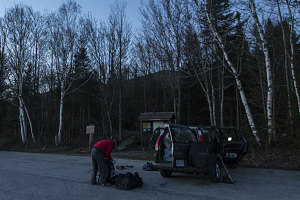 After camping nearby the night before and getting up at an un-deity-like hour, we arrived at our chosen trailhead - the Appalachia Trailhead on US2 west of Gorham - shortly before 5am. 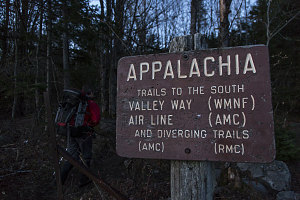 We chose the Appalachia trailhead because it offered us the most efficient and direct connections into King Ravine. 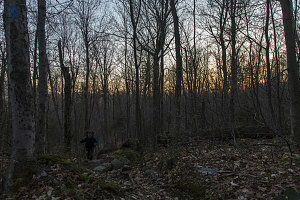 Shortly after 5am, under completely clear skies and calm conditions (the forecast was for a warm, clear, and calm day), we were off, hiking southwards up the gently-sloping grade of the Air Line trail. 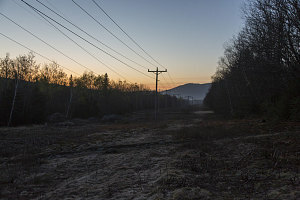 The northern slopes of the Northern Presidentials are criss-crossed with one of the densest network of hiking trails that I've ever encountered. 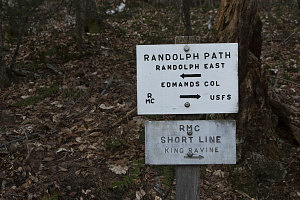 There are trail junctions every half-mile or so, with interestingly and not-so-interestingly named routes heading off in various directions - Air Line, Valley Way, Randolph Path, Amphibrach, The Link. 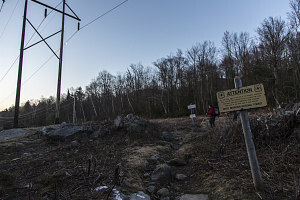 We were on the most bee-line route we could navigate, involving hopping on and off several of these - first on the Air Line, then onto the Short Line, a short shot on the Randolph Path, and eventually connecting up with the King Ravine Trail. 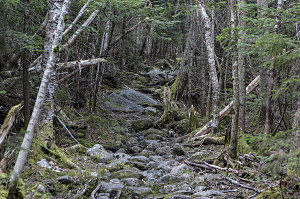 Gradually, the trail morphed from a gentle climb through open woods into a rougher and darker track that led into the depths of King Ravine. 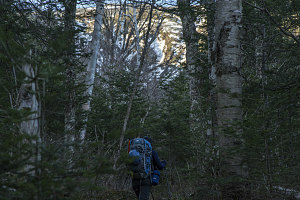 Occasionally we got glimpses of the high walls of the ravine rising above on either side, and more excitingly, glimpses of the snow-streaked slopes of King Ravine's headwall - where the Great Gully awaited us. 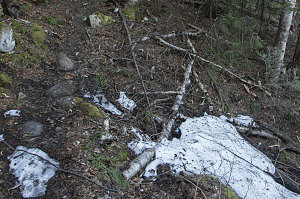 I wasn't entirely sure what condition it would be in - I hoped that it still had a solid and useable amount of snow in it. 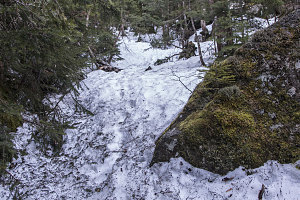 At around 3000 feet in King Ravine, we encountered the first few patches of snow, and the trail became distinctly rougher. 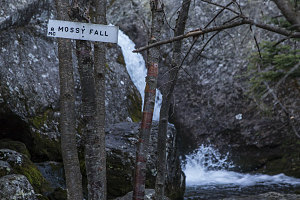 King Ravine has a lot of rough and boulder-filled terrain, and there's pretty much no way that any trail that comes up its bottom can entirely avoid it. 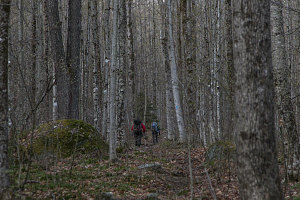 Soon, the trail we were on (the Short Line Trail) joined up with the King Ravine Trail. 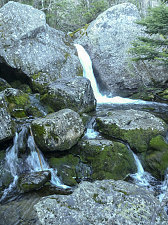 From here we were on the King Ravine trail up to the Ravine's headwall. 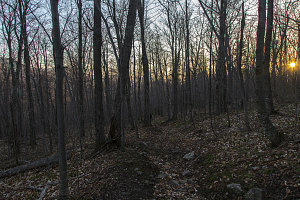 The trail became increasingly rough as we ascended further into the upper reaches of the Ravine. 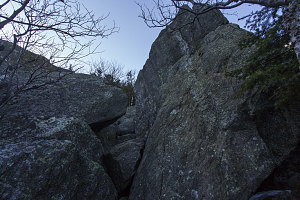 Very large angular boulders were everywhere, and frequently the trail required minor scrambling. 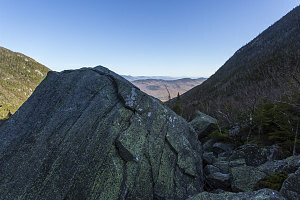 A few especially large boulders provide excellent viewpoints that poke out of the thick scrub, and from one such boulder, I stopped and took in the beautiful view up and down-ravine. It was here that we got our first really clear view of the headwall, and of the Great Gully. 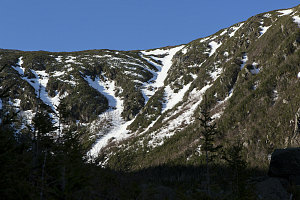 It looked quite impressive from this angle - a long finger of white snow extending from the upper lip of the headwall all the way down towards the floor, eventually disappearing from sight. 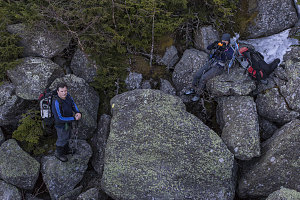 Proceeding further upwards on the King Ravine Trail (slowly, owing to the massive boulders one must negotiate while on the trail), we presently came to a multi-way junction at an open flat spot in the Ravine's floor. 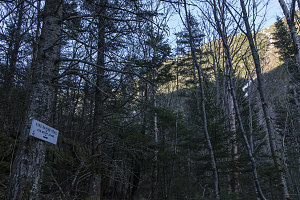 The "Chemin des Dames" headed off to the left, climbing the eastern wall of the ravine; the "Subway" trail led off to the right, through a series of caves underneath the massive boulders in this part of the ravine; and straight ahead was the continuation of the King Ravine trail, heading for the headwall but also to the junction with the Great Gully trail, which we'd be taking to get to the start of the Great Gully Route.